“I am proud to support these two extraordinary Foundations and bring awareness to Parkinson’s, a devastating disease that has impacted so many families, including mine," said Mr. Loepp. Held at MotorCity Casino Hotel, there will be complimentary Valet Parking, a VIP reception, Cocktails and a spectacular Strolling Dinner. The evening will include a silent auction, followed by a presentation, live auction and dancing to the music of "Your Generation" in Sound Board. Sponsorship opportunities are shown below. NOTE: All sponsorship packages at the $25,000 level and higher include: access to VIP Reception, company name and or logo listed on all event collateral material including event invites, event website, PowerPoint sponsorship recognition, event signs, event video, and in all media communication and social media postings. Goal: Our Collaborative Efforts will Increase Awareness of Parkinson’s Disease. Founded in 1996, The Kirk Gibson Foundation for Parkinson’s is dedicated to raising awareness of Parkinson’s Disease (PD), funding research, and promoting collaboration, cooperation, and team work. Through these efforts, the foundation has raised over $2 million dollars to date, investing funds in organizations who work together, build awareness, and share data with others. The Foundation continues to fund and grow patient outreach programs and awareness by hosting special events and engaging in partnerships with other like-minded organizations with the goal of finding a cure for PD. Michigan Parkinson Foundation (MPF), established in 1983, is a non-profit organization headquartered in Michigan. Its mission is to educate and provide support to Parkinson's patients, their care partners, and the physicians and allied health professionals who diagnose and treat those affected by the illness. The foundation provides statewide education programs for families and caregivers, toll free help line, information packets for the newly diagnosed, financial aid for medication assistance, subsidies for in-home respite care, seminars for the medical community and they facilitate 700+ support group meetings at 74 locations in Michigan. A staff social worker is available to assist families in accessing community resources. Last year, the foundation’s programs and services reached 13,000 people with Parkinson’s in Michigan. Blue Cross Blue Shield of Michigan is more than a provider of health care coverage. As a homegrown company that started here 80 years ago, Blue Cross Blue Shield of Michigan feels it’s their corporate responsibility — and privilege — to support causes that promote healthy behaviors and lifestyles, expand access to quality health care, address unique health needs of diverse populations and enable sustainable communities. Blue Cross regularly works with organizations on major events to maximize community impact so they can promote better health. In 2017, they supported kids biking initiatives in Northern Michigan, the Michigan Special Olympics and the National Letter Carriers Association “Stamp Out Hunger”— the world’s largest one day food drive. 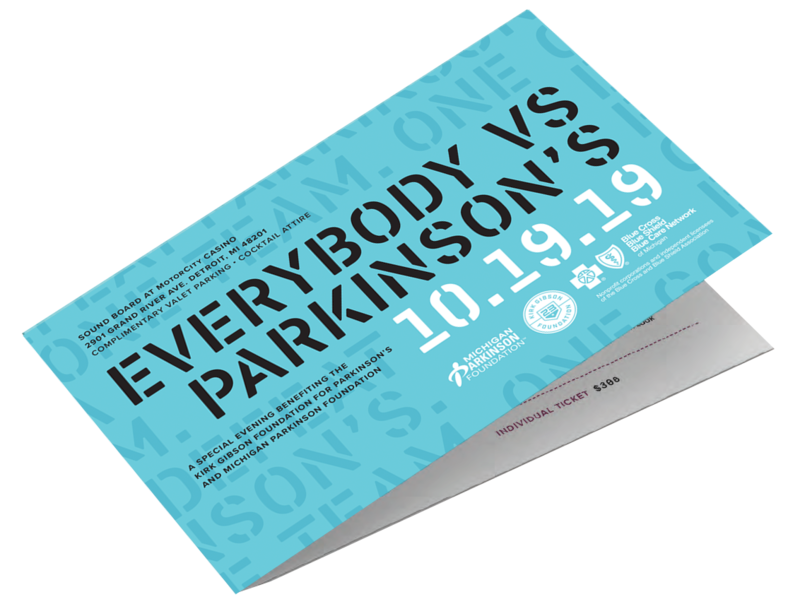 This year, they are proud to work with The Kirk Gibson Foundation for Parkinson’s and the Michigan Parkinson Foundation on a campaign and series of events that will bring awareness and support to the PD community, while directly supporting the Kirk Gibson Foundation for Parkinson’s. For more information on Blue Cross Blue Shield of Michigan, please visit bcbsm.com. Check back to see the Live and Silent Auction items posted to this site. Parkinson’s disease (PD) is a chronic neurological disorder which results from the loss of nerve cells in a specific region of the brain. The consequence is the reduction in an important chemical called dopamine. Dopamine deficiency leads to one or more problems with movement. People with Parkinson’s often have one or more non-motor symptoms such as constipation, urinary bladder problems, depression, anxiety, drooling, difficulty with speech, problems with swallowing, low blood pressure or memory issues. one million people in the US. Careful assessment of symptoms and a thorough neurological examination are the only ways to diagnose the condition. There is no test to confirm the diagnosis but a physician may order a blood workup, a CT Scan, DaTScan or an MRI to help with the diagnosis. Parkinson’s affects over one million people in the US. The economic burden of Parkinson’s disease is $14.4 billion a year in the US. Individuals with Parkinson’s disease incurred Parkinson’s related medical expenses of $12,000 more annually than someone without Parkinson’s. $6.3 billion of indirect costs due to missed work or job loss for the patient or caregiver, long-distance travel for specialized treatment, home modifications, adult daycare, and personal care aides. We reserved a block of guest rooms at the MotorCity Casino Hotel & Spa under the name The Kirk Gibson Foundation for Parkinson's The discounted guest room rate is $189 for a deluxe room. To be guaranteed a room at the discounted rate, you must reserve before September 19, 2019 otherwise room rates revert to the best available rate at that time. To reserve a room, call 866-752-9622. Complimentary valet parking is available and located at the Sound Board entrance (on Brooklyn Street (t the corner of Perry St.) Guests are welcome to self-park at the Hotel Parking Garage also located on Brooklyn St.
We can accept all forms of credit card payment, personal check or cash.